After two world wars and millions of dead, German attempts to dominate Europe through military force ended in ruin. Now, in an historic irony, Germany has ascended to unquestionable European supremacy, but it is a power not imposed by the bayonet. Today, the once mighty nations of the West tremble on bended knees before German diktats, yet this has been accomplished not through tanks or soldiers, but through philosophy, politics and money. Europe now thinks in terms set by the German philosophers of yesteryear. Those proud Europeans who would be ashamed to retreat in the face of the German armies, now find themselves captive victims before the almighty power of the Deutschmark, rebranded as the Euro. The European Union, a much touted institution of supposed equality and progress, is Germany’s new organ for pursuing its interests. To start with the metaphysics, contemporary German hegemony over the West is almost without competition in European minds. War and politics stand tall in European history, but it is philosophy that defines the movements of an era. 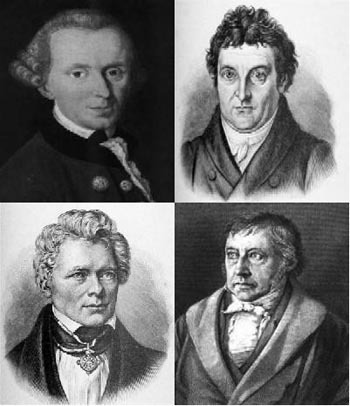 Where the soldiers of Germany failed to conquer, the German philosophers Emmanuel Kant, Friedrich Schelling and Georg Hegel have taken by storm. Modern philosophical Idealism with their correspondent Phenomenology, Existentialism and Personalism derive from these key German thinkers. The basic error of Idealism and its derivates is to deny the objectivity of the reality that surrounds us. Once this non-sense is admitted as possible, one enters – like almost all the Intelligentsia of the West did – the slippery slope that ends in Pantheism or the Eastern philosophies of Hinduism and Buddhism. Hegel’s dialectics is implicit in most major schools of thought. Thus, it is not exaggerated to affirm that today’s West finds its expression in German Idealism or their derivatives. Idealism, in turn, sets the stage for religious, societal and moral relativism. The Hegelian “synthesis” of ideas, whereby two seemingly opposed “truths” merge and create a new and superior ”truth,” has inundated Western thought. In a most noteworthy example, the Hegelian “synthesis” has taken root in the heart of today’s progressivist Vatican. As a political spectrum, Europe now revolves around its German center of power. Germany influences its neighbors either directly with its policies, diplomacy and actions or indirectly through the reactions that other nations take in response to Germany’s supposedly disinterested initiatives. With the U.K. leaving the EU via Brexit, the top two deciding powers of Europe now are Germany and France; and between the two there is no contest: Germany indisputably has the last word. France, the runner-up for European leadership, still lags far behind Germany in terms of political power and economic might. The election of Macron brought hopes of a French revival, but even as he struggles to live up to these expectations his position is staunchly pro EU and pro-Germany. Macron stands firmly in favor of the EU, globalization and the erosion of national sovereignty in favor of a more integrated European Union. 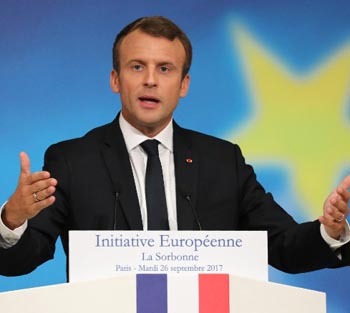 His position falls in line with German intentions; he has already expressed his desire for France to work on the (ultimately German) goal of creating a stronger EU. France plays first violin to an orchestra whose maestro is Germany. It is an orchestra in which no nation can hope to challenge Rhineland supremacy. The extraordinary recovery of the German economy following World War II carried on into reunification, making Germany the economic powerhouse of Europe. Demographically it is home to Europe’s largest population, a thriving export economy, and a thrift-oriented mentality that is backed up by German dedication to by-the-book procedure and forms. With EU policy enshrining free-trade German goods have flooded the markets of Europe, enriching Germany while its neighbors languish in stunted economies. Even the Euro is, functionally speaking, a mere re-labeling of the Deutschmark, the German national currency. When the Euro was implemented there was no currency rise for Germany, allowing for greater economic stability. With this self- perpetuating economic clout Germany has taken to calling the shots in Eurozone policy. When Greece began to fail it was Germany that dictated the terms of its options. When the European Union seeks to implement financial assistance or discipline it is Germany that has the final say in the terms, justifying its actions by pointing to its massive contribution to EU funds. This is amply demonstrated by the 2016 Iberian deficit problem, where German influence changed the conclusion of the European Commission. In 2016 Spain and Portugal, facing devastating unemployment and economic stagnation, ran deficits in an attempt to stimulate their economies back into action. The deficits exceeded the 3% limit placed upon them by Brussels, causing the EU to draft sanctions against the two Iberian countries for their economically threatening behavior. 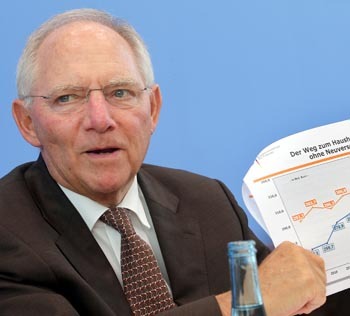 Right when Brussels threatened heavy EU sanctions Wolfgang Schäuble, the then German finance minister, stepped in. Working feverishly to phone commissioners and pressure officials Schäuble managed to turn the opinion of the European Commission against sanctioning his political allies in Spain and Portugal. Where before the sanctions were seen as a foregone necessity, suddenly political “opinion” reversed and Spain and Portugal found themselves sanction free. Regardless of whether the sanctions were justified, this occurrence demonstrates one thing: German interests are in control of the EU. After the ruling on Spain and Portugal Jean Claude Juncker, Chief of the European Commission, stated: “We must not be more Catholic than the Pope, but please make it known that the Pope wanted a fine of zero.” The “Pope” in this comment was German finance minister Schäuble. Germany is at the helm of the European vessel that continues to sail towards the end of national sovereignties, the gradual corrosion of independence, and the abandonment of any moral and ethical residue left over from Europe’s glorious past Christendom. With a three-fold noose Germany is dragging Europe behind it, reducing thought to relativism, cowing smaller nations into line with political bullying, and backing up its actions with sheer economic force. 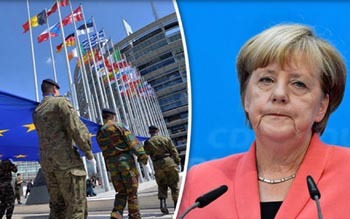 Germany has become the tool, the instrument by which Europe is coaxed into the abandonment of national sovereignties and the desertion of Christian principles. With German guidance Europe is well on its way to joining the ever growing monstrosity of 21st century globalism.